I am not one of those girls who dreamed of trying on wedding dresses. It was the one part of bring engaged I looked least forward to. One day after a few too many mimosas, my Mom and 2 maids got me to do it. I was miserable. I do not like being put on the spot to make decisions and I cannot stand someone trying to "sell me a car". That is what I felt like the day I tried on dresses. While I love to buy things, I cannot stand shopping. It's why 99% of my Christmas shopping is done online. By the 10th dress, I was broken out in hives and having a minor panic attack. At least I knew what style of dress looked best on me at the end of the day - a one shoulder or strapless gown that was either mermaid or trumpet. I wanted lace, my Mom wanted me in satin. After receiving the Allure dress, I did the unthinkable. I took a leap of faith, one many brides couldn't imagine doing. Every night, I stalk the weddingbee.com classifieds, not looking for anything particular. 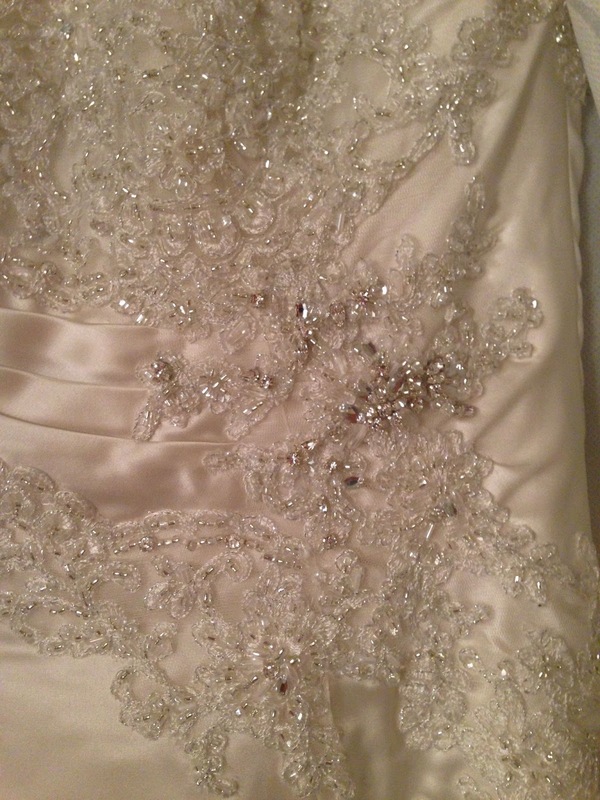 Last Tuesday at 11:30pm, I saw a listing "Guaranteed Authentic Designer Gown Liquidation, Watters, Maggie Sottero, Casablanca $249". The Maggie Sottero listed was one size too large for me and without consulting with my Mother or any of my bridesmaids, I purchased it, sight unseen without trying this particular style on. I woke up on Wednesday freaking out. Dang you wine!!!!!! I love Maggie Sottero dresses but never thought to look at them since I knew it was out of my budget. When our wedding day arrives, I will be a 35 year old first time bride and the last thing I want to do is drain my parents retirement for my wedding. While they are being very generous with giving me $10k towards the wedding, anything above and beyond is out of my pocket. I took a chance with ordering this dress but for $249, the worst that could happen is me hating it and reselling on eBay. On Friday afternoon, the dress arrived in perfect condition. I cried when I saw it. This dress is 100% authentic, never worn, all tags intact and words cannot express how beautiful it is. 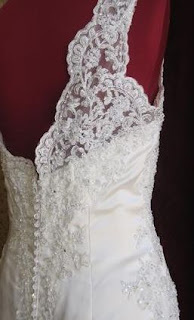 I cannot show you the entire dress today since Gabe sometimes reads my blog but what I can do is show you some of the amazing bead work and lace on this dress. And the lace back and crystal work on the back. My Matron of Honor is going to have a field day with those crystal buttons (pay back is a beotch). The dress is a little large on me and will need some alterations but that is perfectly fine with me. 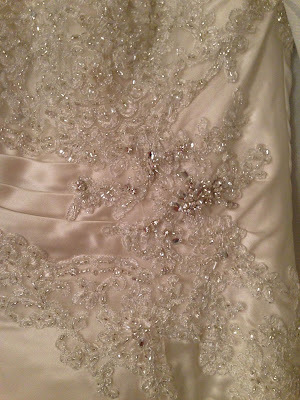 This Maggie Sottero dress retails at $1120 and I spent $270 after shipping, saving more than 80%!!! I successfully purchased two authentic designer gowns online for less than $600 total. The two dresses together would have cost more than $2000 combined. I am living proof that you can absolutely get beautiful wedding dresses without breaking the bank. You just have to make sure you do your research and know what style of dress to look for. Do not purchase your dress from China. I have heard countless horror stories and the stress you will put yourself in while waiting the 20-30 days to receive the dress is not worth it. I stressed over the 2-3 days each of these dresses took! There are plenty of pre-owned wedding dress websites. Many of which, I have seen people list gowns that have never been worn. Check eBay - save a search with the dress you are looking for. Make sure you filter out dresses from overseas. Ask for photos of every detail to make sure it is authentic prior to purchasing. You want to see the tag, the stitching, a closeup of all the detail work. Look at you!!! I feel like an awful friend. I completely forgot that it was arriving last week!! I never heard the story about you opening it up/trying it on. Next time we talk, please tell me all about it! I must say, I admire you. You are gutsy and definitely an inspirational budgeter! lol. The dress is gorgeous and you're gonna look so amazing in it. AMAZING buy for sure. Thank you!!!! My Mom lost it when she saw me in it. I still have it in my possession until this weekend, I will show it to you at lunch tomorrow! sooooooo exciting!!! I cannot wait to see the pictures from the big day! Thank you! Big day is so far away. I don't know how I am going to last another 13 months! They say it will go fast but I am second guessing my decision on a fall 2014 wedding now. What amazing bargains! Your dresses both sound gorgeous...I can't wait to see you in them! Thanks Kat! I was so nervous about taking both chances but was very lucky with the outcome. I was just like you - trying on wedding dresses was NOT my thing. In fact, a wedding dress at all wasn't really my thing. I ordered a short white dress from J. Crew (back in the day before they had the huge wedding dress selection they have now), and called it good. haha. I am telling you, I have feared that day of trying on dresses for as long as I can remember. I do not like opening presents in front of people, I think it is a reaction thing - like people expect you to react in a way. I hated the fakeness of the employees in the store, I know they just wanted to make a sale off of me. I am very happy with my outcome! Yes, THAT! I hate that people stare at you, expecting you to like, FREAK OUT - OMGGGGG THIS IS THE DRESS! Damn "Say Yes To The Dress" has spoiled it for everyone. I liked trying dresses on at home alone, and being like "oh, ok - this works." hahaha. So I turned it on them - we are having a lets say yes to the bridesmaids dress day this Sunday. I still get the champagne! So you get to sit there and drink while they do all of the (slightly embarassing) "work"? Sounds perfect. They both look gorgeous, how exciting for you! It's good it arrived a little big because now it can be made to fit you perfectly. I would email the site and suggest they add a search bar and categories though. The site is so hard to navigate and someone looking through their evening dresses or for prom has to go through pages of wedding gowns. That's exactly what I said about the size too big! Now my very talented seamstress can custom fit the dress to me. I know the site is very dated - I don't think she posts much on there, I think she mostly does weddingbee.com classifieds. I was very lucky to find her that night for sure. How exciting! Great finds! You are probably soaring over the deals. Thanks so much Bonnie! I don't know what I am more excited about, the actual dresses or the fact that I got two dresses for less than $600! That is awesome! I am so happy that it worked out for you. I am right there with you on hating the whole shopping for a wedding gown in a store. It felt so weird and awkward trying on dresses in the middle of a store on a pedestal. I luckily found mine after only a few dresses. I can't wait to see the full picture!! Such great deals on both of those dresses: I can't wait to see them in person!